After my epiphany, I immediately thought that I had a great Song of the Day candidate, only to realize that I had featured the song already more than two years ago. But my “no song more than once” rule is restricted to unique versions of each song, so today’s live performance of ‘Fly From Heaven’ is allowed. So what’s the song about? Well, it’s sung from the perspective of James, the brother of Jesus, who is upset by the perversion of his brother’s message by the Apostle Paul. Paul preached that faith alone would lead to salvation, while James believed that good deeds were necessary (and his brother taught as much). This song is about that struggle. It’s really quite obvious, too. But for some reason, I never connected Paul and James to the Bible and imagined a much more contemporary setting, perhaps tied to a tragedy within songwriter Glen Phillips’ own family. I like this song even more now that I appreciate the meaty subject matter. This entry was posted in song of the day and tagged Dulcinea, Fly From Heaven, Toad the Wet Sprocket. GIven my ignorance of most things religious, I suspect I would have never figured out the meaning of this song, though, once you point it out, it is quite obvious I suppose. Yeah, sorry about the poor quality. It was basically a cheat to get the song out there again. I’ve loved this song for at least ten years . And Always felt a spiritual quality I just couldn’t unravel. The Paul, James Jesus conection is perfect, perfect. Thank you. Blessings, DK. Gotta go have a listen, a new, brand new listen. The song is a bit more complicated than described, and I think is about a person struggling with who Jesus is and whether or not He is God as he claimed. This is the consistent theme of the lyric. The key to knowing the precise meaning is likely found in the meaning of brother, and whether it refers to a sibling, or a fellow Christian. My interpretation is below. The first verse is about the conversion of Paul. Paul is the brother. Jesus changed the teaching of Paul as he went from denier to believer. Jesus changed the name of Paul from Saul. The verse specifically recounts the first visit of Paul to Jerusalem after his conversion where he met with Peter, James and John. The last line of the verse confirms that it is about Paul, as the author is now saying that he would give his life for his new Christian brother. James would not have died for Jesus. James was not a follower of Jesus until after Jesus’ resurrection. I do not believe that James attended the crucifixion, as from the cross, Jesus put the care of his mother into the hands of his follower John. The last verse could also be about Paul, it could be about Jesus, but it could be about all of the Christian martyrs, which would be a natural consideration when dealing with conversion from a logical perspective. The middle half verse is Phillips’ statement on human frailty, human destitution if you will. We are broken and need to find faith to try and resolve the brokenness. The choruses are what tell us what the lyric is about. The consideration of the person and deity of Jesus is are not germane to a discussion of how Paul might have changed the teaching of Jesus. Note that the latter position is a minority view. Notice that the second line of the chorus changes from “You’d give him any ending” to “Or is it just the beginning” which is a change from questioning to entertaining the possibility of the resurrection. The third verse goes further. It loses the line “Like water through my hands” which is a metaphor for not being able to grab and hold onto Christian belief. Instead, Phillips debates the deity of Jesus. “Will it be the end.” Jesus is dead and buried or “Is he still ascending” which would be true if Jesus is God as He claimed. The rest of the chorus is Phillips considering Christian salvation; the “second coming” of Jesus is not considered. “if He’s all you say, would He fly from heaven to this world again” might be a confession of faith. He is asking, will “Jesus come to me if I ask?” Will Jesus come to me and be my savior? My explanation is lengthy and complicated, but I believe it better explains the various sections of the song, which cannot be adequately explained by a simple disagreement between James and Paul, especially when it is likely that no such disagreement ever existed. As far as the faith or lack thereof of Phillips, these arguments hold no weight as he continually deals with philosophical issues and introspection. That he would write about Christian belief or practice is not surprising. 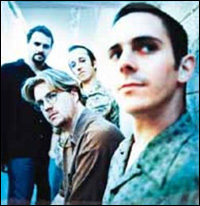 I will say that I saw Toad the Wet Sprocket last night. The opening act was Jonathan Kingham. Glen Phillips joined him on his final song “Grace” which is an obvious reference to the grace of the Christian God. After all, Jesus, Peter and Paul are all Jews.